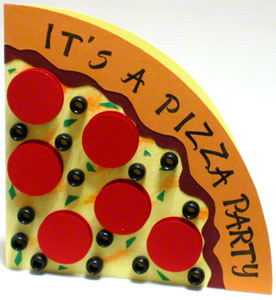 Your pizza party invitation gives the first impression about your pizza party. Why is this so important? Consider this: in these parties, people get together for, at least, one major activity... to eat pizza. So, why should anyone think your pizza party would by any different? Why should they expect your party to be fun and special? This is where your pizza party invitation does the trick. Give the impression that your party would be different by making a colorful and creative invitation just like this one. Score the 5” x 10” creamy yellow cardstock right in the middle and fold it into a 5” x 5” cardstock paper. Use a 10” diameter circle to create a curved corner at the top right of the card. Use brown and mustard colored pencils to add random shades on the card. On the 5” x 5” mustard colored cardstock, use the same 10” diameter circle to cut out one curved corner. Use pencil to sketch out random wavy curves that represent the pizza’s crust. This crust is about 1” wide. Cut out the crust as sketched and erase any pencil marks afterwards. On the 5” x 5” maroon cardstock, use the same 10” diameter circle to cut out one curved corner. To save time, you can tape the creamy yellow, maroon, and mustard colored cardstocks together. Then, cut them all at once. Glue the mustard colored crust on the maroon cardstock with the outside curved edges aligned. Sketch out random wavy curves on the maroon cardstock about 0.25” away from and similar to the mustard colored random wavy curves. Cut out the maroon cardstock crust as sketched and erase any pencil marks afterwards. Punch out twelve 1” diameter holes out of the 3” x 8.5” cardinal red paper using the hole punch. Cut the double sided adhesive foam pieces to get six 0.5” squares. Glue each of these foam pieces between a pair of punched out circles. Randomly glue the layered red circles on the card. Then randomly glue the black beads on the card as well. Finally, cut the small piece of green cardstock into tiny confetti pieces. And glue them on the pizza party invitation to represent vegetables. If you don’t have double sided adhesive foam pieces, use glue on both sides of regular foam board after cutting to size.